In my latest “In Good Faith” column, I take on the issue of vacation time and why we all need Sabbath time whether we know it or not. Let’s face it, the concept of “vacationing” with young children is an oxymoron. There’s nothing the least bit relaxing about schlepping around the country with toddlers in tow. Perhaps a more accurate name for such family endeavors would be “traveling chaos.” My boys are older now – 10 and 12 – but I specifically remember morphing into the guy I used to laugh at in airports; trudging through Concourse B like a beast of burden heavy laden with car seats and strollers and diaper bags with nary a skycap in sight. But the getting there is only half the battle. Sleeping in a single hotel room with one child who insists on falling asleep with the light on and another who insists on falling asleep with the light off is not for the faint of heart. And God help you if the Elmo blanket was accidentally left on the airport shuttle. I have vacations on my mind because I’m in the midst of some time off. I have to admit that, like many Americans, I’m lousy at taking vacations. Sure, I look forward to them. I love spending time with my family and nothing beats a day at the beach – whether it’s Nantasket or Waikiki (though the odds of finding Kona coffee are slightly slimmer in Hull than Hawaii). But my BlackBerry, laptop, the Internet and general availability by cell phone all conspire to make even the most remote spot a mere office satellite. Technology has become the world’s longest umbilical cord connecting overachievers and workaholics back to the office. In other words I can run, but I can’t hide. And I’m not alone. For many people “vacation” simply means working from somewhere else. This is likely driven in part by the fragile job market – “If I’m not showing my dedication by producing all the time, they might decide my position is expendable” – and by our general inability to relax. A recent Reuters poll showed that 59 percent of Americans don’t even take the full allotment of their annual vacation time. And CNN reported that in 2010 we gave up $67 billion in vacation days. Wow. Talk about a country in desperate need of a collective vacation! It’s no wonder so many of us are stressed out, spend significant chunks of our disposable income on coffee and feel like we’re on a constantly moving treadmill with no end in sight. I’ve been known to check my work email on my day off and while on vacation if for no other reason than to minimize the slew of emails that invariably accumulate while I’m gone. I tell myself I’m doing myself a favor but am I? The reality is that when we’re always available we’re unable to enter into the profound Sabbath time that our souls crave. Time off – true time off not merely the outward appearance – is essential to our physical and spiritual well-being. Without it relationships suffer, creativity dwindles, perspective is warped and life becomes an obligation rather than a joy. Sabbath time allows us to set aside the cares of our lives for a time in order to focus on our relationships with God, with one another and with ourselves. These three ultimately are what life is about – everything else is tangential. And time away allows us to regain the perspective that allows us to lead more healthy, productive and joy-filled lives. Take some Sabbath time and another reality quickly emerges: We’re not nearly as important as we think we are. If we’re not available, people will make do, life will go on and things will get done. The world survived without us for millions of years. I have a funny feeling it won’t miss us too much if we’re out of touch for a week or two. And anyway if even God rested after creating the world, I think we can all get away with some guilt-free time off. I’m used to people pre-boarding. Fine, let the first class folks board first — they paid for it and they all look like they need a drink. And having been one of those parents traveling with small children, I understand that special ring of hell — let them get on with their car seats, diapers, screaming children, etc. They, of course, also look like they need a drink. But then there’s that middle group that I don’t understand — in addition to the “Olympic” travelers awarded gold, silver, and bronze (or whatever it is) there are a host of others with “preferred” status. There’s the Chairman’s Club (though you might have to be a Chinese communist to qualify), and the President’s Preferred members, and Advantage Gold, to name a few. As that original Biblical stage mother — the unnamed mother of James and John — clearly knew, rank matters. At least to humans. When she pulled Jesus aside to try and persuade him to let her sons sit at his left and his right in the Kingdom of Heaven, she was basically trying to get them Platinum Elite status. And Jesus would have none of it. Despite what titles the airlines convey we’re all in this together. 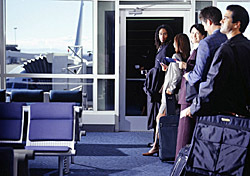 The whole notion of frequent flyer royalty is just another way to mask our deep insecurities. By pumping up our egos with absurd-sounding memberships we’re feeding into what we crave: being assured that we’re better than others. My favorite title bestowed upon airline passengers? The vaulted “Elite for the Day.” I’m not sure how you earn that or what the airline screwed up to give out such a title, but even fleeting eliteness was enough to let you board before the clergy from Hingham. As I said to Anne, “I don’t need to be elite for the entire day — how about just the next ten minutes?” But then again we — and our luggage — all made it to the same destination on time and in one piece. 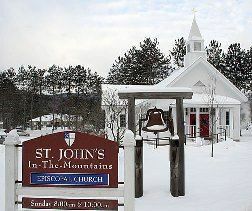 My best friend from my seminary days was just called to be the rector of St. John’s in the Mountains in Stowe, Vermont. I encourage all of my clergy friends to accept calls to resort towns so that I can visit. It’s not working too well for me but this is a step in the right direction. The Rev. Rick Swanson (who is also Ben’s godfather) has had a pretty varied vocational life to this point — he served as curate at a parish in California wine country, was an associate priest at a large church in Morristown, New Jersey, was the part-time rector for 4 1/2 years at a small church in Dowagiac, Michigan, and will be moving to Stowe next month. Along the way he’s had some challenges but he has always remained faithful, above all else, to God’s call. 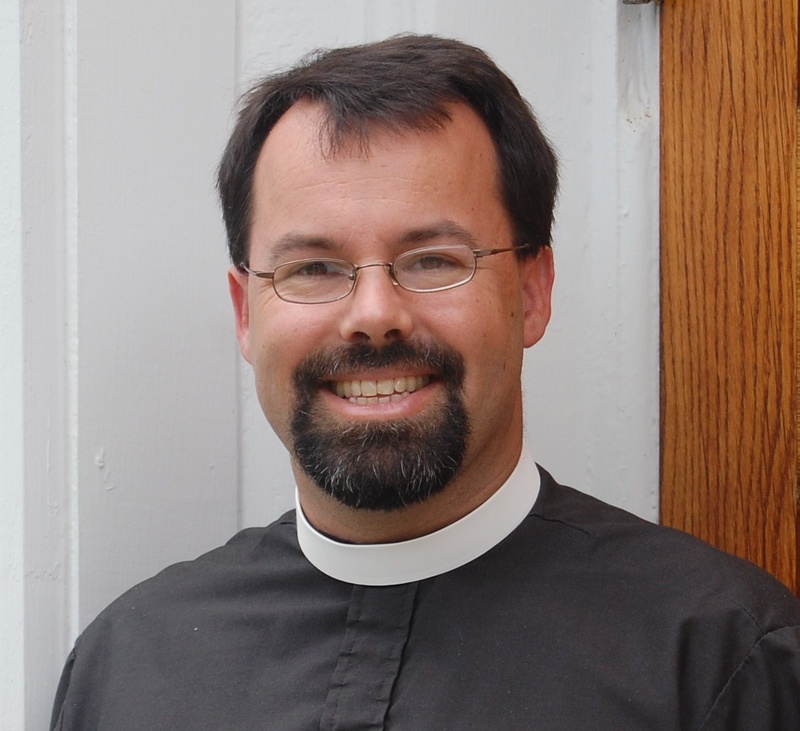 Rick is a man of prayer, someone who has wrestled for years with a call to monastic life, though in the end he discerned that God was calling him to remain a parish priest. His new parishioners will be lucky — they’re getting a priest who loves Jesus Christ and is passionate about making God known through divine liturgy. He’s a creative, compelling, and thoughtful preacher and, more importantly given his new locale, he likes snow. Being a native Minnesotan will do that to you I guess. He was also on the US Junior World speedskating team but he likes to keep that information under a bushel for some reason. So I always take great joy in telling people this and watching Rick blush. We put Rick’s speed to good use at seminary. He was the running back for our flag football team at Seabury-Western and we nearly beat the boys at Nashotah House in the annual Lavabo Bowl. This was quite the moral victory since they were all big young guys from the Diocese of Fort Worth (who else goes there these days?). I wish Rick the best in the days ahead — I know the emotional energy it takes to leave a congregation. But I also know the excitement of being faithful to the call process. And the bunny hills of Stowe better be prepared to receive the Schenck family. We’re animals on those things. Revolution in the Air! Again. After spending the past few days in Colonial Williamsburg I’m convinced the whole experience is a combination of The Truman Show and Groundhog Day. A new day? Revolution’s in the air. Again! And I’m not sure whether all of the “colonists” know they’re just play-acting. Some of them take their roles so seriously I swear I was getting looks like we were the ones oddly out-of-place with our cameras and t-shirts and soft drinks. Don’t get me wrong. We had a great time down there — hanging out with our friends Harry, Andrea, and their daughter Madeleine (Harry’s an old Army buddy). And I’d always wanted to spend over $40 on replica muskets. At least we were all well protected on our walks down Duke of Gloucester Street. There’s also a slightly cult-like feel to the whole place. Or at least the conspiracy theorist in me felt it. It takes a special person to dress up in knickers and wander around in the hot sun all day. One morning on the way to Aromas Coffee Shop in Market Square, I saw a young professionally-dressed woman driving an SUV. In the passenger seat was a man, presumably her husband, dressed up like a colonist. She was obviously driving him to work. “Have a great day, honey; give the Royal Governor hell.” Then I went for a quick run around five o’clock the next day and all of the 9 to 5 colonists started walking out of the historic district at the same time. I think they instruct them to walk alone — don’t want to hear them complaining about the tourists. Seeing them all slowly walking out of the various shops — the gunsmith, the printer, the cooper — it looked to me like the Day of the Dead. But that’s just me. One day we’ll go back — you can’t possibly learn all the history in one trip. Plus, I need to get myself a musket. And if I ever need to enter the witness protection program, I’ll hide myself in colonial America somewhere in Williamsburg. Check out the blacksmith shop. Greetings from Grimes County, Texas. I’m down here for the Episcopal Communicators conference at Camp Allen, located 45 minutes from Houston. I have no idea in what direction. Besides some engaging workshops and catching up with friends and colleagues from across the country, I’ve been experiencing a bit of Texas culture. Some might argue that “Texas culture” is an oxymoron. “Flavor” might be a better word. I am at a communicators conference after all so word usage is important. Last night we were treated to a “chuck wagon dinner” out by a lake. There was a genuine (gen-U-ine) chuck wagon and what I was assured were “real” cowboys cooking up the chow. This was no Euro Disney cowboy experience; this was serious stuff. If I’d asked for tofu I might have had my head blown off with a 12-gauge shotgun. The head chef may well have been the original Marlboro Man — though, as I think about it, I believe he died of lung cancer at some point. So perhaps it was his brother. But I ate the largest steak I’ve ever seen. It was huge! I mean this thing would be enough to make a vegan crawl into the fetal position and weep. And it was delicious. After 13 miles I came back in and had cheese grits with black coffee. A perfect way to start a day somewhere in the Lone Star State. I’m sitting at Kansas City International Airport on a rainy afternoon waiting for my flight to take off. I have a sneaking suspician it’ll be late since it hasn’t yet arrived at the gate and it’s due to leave in 30 minutes. I’ve spent the last two days here for an Episcopal Life Board of Governor’s meeting. In between a heavy dose of meetings I was able to get in a nice dose of barbecue at the famous Jack Stack Barbecue restaurant. I’m not sure if everything is up-to-date in Kansas City (certainly not my flight), but the BBQ is delicious. Unfortunately the small bottle of barbecue sauce I had in my carry-on bag was confiscated by the TSA gestapo. Sorry, Bryna, I’ll be arriving home empty-handed. They did let me keep my tube of toothpaste after rifling unceremoniously through my bag so you’re welcome to that. One of the reasons I’m carrying on my bag (aside from time-saving convenience) is because Midwest Express now charges $15 to check a bag. That’s the fee for the first one; the second is $25. I understand USAir is now charging $20 for a blanket/pillow combination. Of course you get to keep it which will certainly get you through a long, cold winter. Or at least your lap. In a climate controlled, pressurized environment. I’m almost used to the fact that many airlines charge for snacks and the formerly complementary soft drinks. But some airlines are even charging extra for window and aisle seats. Stop nickel and diming us! I’m happy to chip in for things like, oh, jet fuel but what’s next? Charging a fee for the drop down mask in case there’s a drop in cabin pressure? A lavatory fee? A barf bag surcharge? I realize I’m just cranky because my plane’s delayed and they confiscated my BBQ sauce. I’ll go ask for a discount at the ticket counter. I can cross Mississippi off the list. It was one of the few states I had never been to but I write this from the Credo Conference being held in Canton, MS at the Gray Conference Center. So it’s off the list. I realize getting to Mississippi before you die generally doesn’t make anybody’s top ten list. But it did make me reflect upon which of the United States I still haven’t gotten to. Alaska’s the big one — though listening to Sarah Palin makes me feel like I’ve been there. Or at least that I can see Russia from here. But there are others: South Carolina, Montana, South Dakota, Oregon, New Mexico, and Idaho. I knocked off the state of Washington in the spring by attending an Episcopal Communicator’s conference out there. 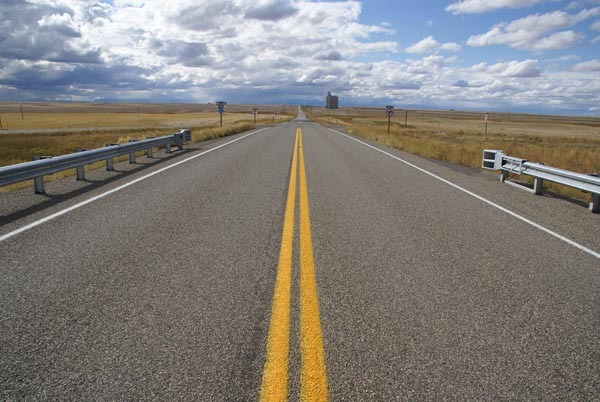 I do hope to get to every state before I kick the bucket. Not for any particular reason, but just because they’re there. In the spirit of “when in Rome” I had grits for breakfast this morning. I used to eat grits in Army chow halls but I now realize they were pretty lousy as far as grits go. I remember choking them down because I had a commanding officer from Alabama and he basically ordered us to eat the grits. This morning was the real deal — and, with a touch of brown sugar, they were delicious. The grits were followed by crawdad etouffe for lunch and topped off with broiled catfish and turnip greens for dinner. Incredible. And not a bad culinary introduction to this much-maligned state. I might have to move here just for the food and southern hospitality. Just don’t tell Bryna.